It has been discovered by experts that the major cause of skin cancer, burn, allergy vaginal inflammation e.t.c is as a result of the chemical content we use on our skin such as; Cream, Perfume, Roll On, Soap etc. 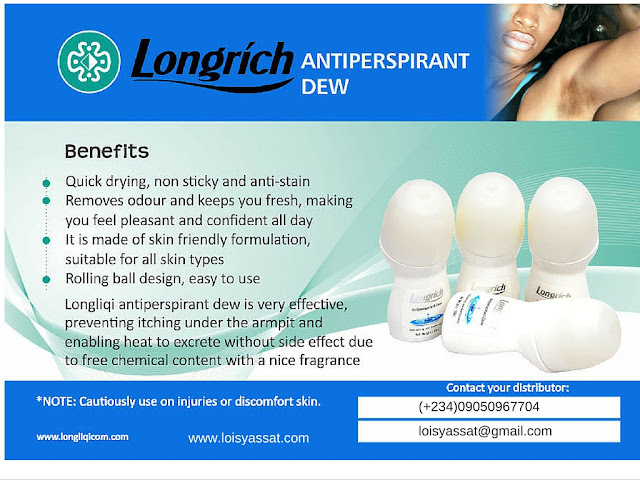 Longliqi antiperspirant dew is very effective preventing itching under the armpit, enabling heat to excrete without side effect, due to free chemical content with a nice fragrance. DIRECTION FOR USE: Apply to the armpit evenly. NB: Cautiously use on injuries or discomfort skin.